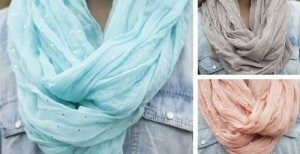 Spring Polka Dot Infinity Scarf Only $4.99! You are here: Home / Great Deals / Spring Polka Dot Infinity Scarf Only $4.99! Check out these great scarfs that are perfect for layering with the cute Spring & Summer dresses! Spring Polka Dot Infinity Scarf Only $4.99! Choose from 4 hot colors that are perfect with any of your maxi dresses! Grab this and other hot deals on fashion every day at Jane!